Outlined below is a complete list of our terms and conditions for your reference. Please read though them carefully before placing your order. "Custom Canvas Ltd" means Custom Canvas Ltd also referred to as "we" or "us" in these terms and conditions. "Catalogue" means the catalogue of products and services offered by us. "Force Majeure" means any cause affecting the performance by Custom Canvas Ltd of its obligations arising from acts, events, omissions, happenings or non-happenings beyond its reasonable control including (but not limited to) governmental regulations, unexpected machine failure, power shortages, snow or severe weather, courier error, fire, flood or any disaster or industrial dispute affecting a third party. "Working days" means Monday to Friday, excluding Bank or other Public holidays. It also does not include any other days where we are scheduled to close. "Response Time" means the amount of time we aim to respond to your inquiry by. This is 4 working hours for any emails or faxes and 2 working days for letters. Though we endeavor to respond within these guidelines we cannot be held liable for any delays caused by responding later than the stated time periods. All contracts of sale made by Custom Canvas Ltd shall be deemed to incorporate these terms and conditions, which shall prevail over any other terms from the party ("the Customer") with whom we are dealing. Cancellation of orders by business to business customers is not accepted. Cancellation of orders by Consumers will be accepted in accordance with the Consumer Protection (Distance Selling) Regulations 2000. Nothing in these terms and conditions is intended to impinge upon a Consumer's statutory or contractual rights to reject faulty goods. 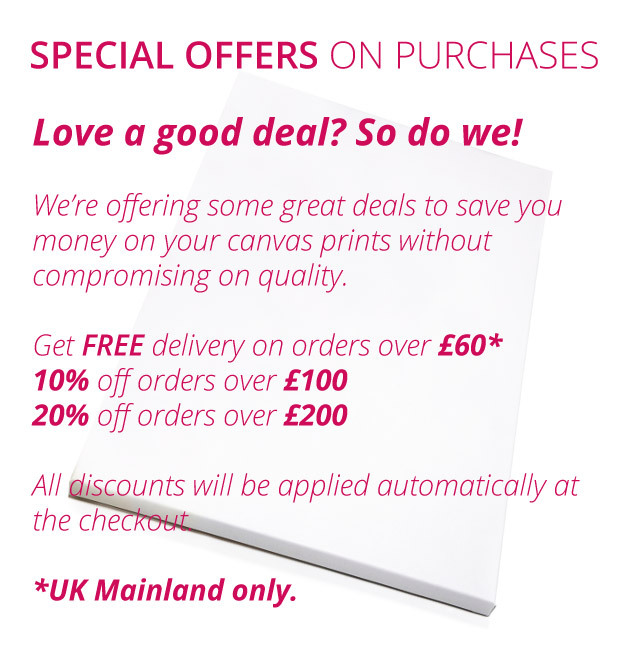 All orders are subject to acceptance and to availability of the goods ordered: Custom Canvas Ltd is entitled to refuse any order placed by you. Customers are able to check the status of their order online by entering their order number and post code into our order status checker. We strongly advise customers to check this on a regular basis. Our preferred method of customer contact is email, if you think you are not receiving emails from us please check your spam folders. We cannot be held liable for delays to your order from emails not reaching a customer. We reserve the right to send you promotional offers via email or post. If you do not wish to receive these offers please contact us to request removal from our mailing list. We will not share your personal data with any third party without your permission. If we have to hold your order an email will be sent to you. We strongly advise you to regularly check your order status online and contact us immediately if your order is held to avoid delays. Though we endeavor to keep prices as accurate and up to date as possible sometimes errors do occur. If a price error has occurred we will inform you of this at the time of order. Custom Canvas Ltd shall use reasonable endeavors to despatch goods by the date agreed with the customer, but does not accept liability for failure to deliver within the stated time. We are not liable for delays caused by the customer including by not limited to: incorrect artwork, delay in file approval etc. In no event shall you hold The Company liable for any direct, indirect consequential, incidental, special, punitive, or other damages whatsoever. Custom Canvas Ltd does not accept liability for shortages or damage to deliveries unless the Customer notifies us of the shortage or damage in writing within a reasonable time of receipt of the delivery. If a consignment is found to be damaged please sign for the consignment as damaged. If you are unable to check the consignment please sign for the consignment as damaged. In order for us to resolve all the original packaging and the product(s) must be kept for at least 28 days from the date of delivery for inspection. Title in the goods does not pass to the Customer until payment is received in full. re-arrange delivery provided that Custom Canvas Ltd may charge the Customer for the additional delivery costs incurred. Upon delivery of the goods, the Customer will be asked to sign a Proof of Delivery to acknowledge safe receipt. It is the responsibility of the Customer to ensure that the number of packages delivered corresponds with the number stated on the delivery note. Where a discrepancy occurs or where there is evident damage to the packaging, this should be noted on the Proof of Delivery. We shall not be liable for discrepancies or damage evident on delivery where the Customer accepts delivery and signs the Proof of Delivery without amendment. Custom Canvas Ltd will endeavor to ensure that goods are delivered on the date stated in the selected delivery method at the time of purchase however Custom Canvas Ltd cannot be held responsible for delays caused by customers or any other factors deemed appropriate and consequently are not obliged to refund delivery or order charges in these cases. Delivery options in the cart will vary depending on delivery location. Customers are responsible for selecting the correct delivery location and method at the time of placing an order. Custom Canvas Ltd reserves the right to retain any shipment where inadequate postage has been paid. BT1, BT10, BT11, BT12, BT13, BT14, BT15, BT16, BT17, BT18, BT19, BT2, BT20, BT21, BT22, BT23, BT24, BT25, BT26, BT27, BT28, BT29, BT3, BT30, BT31, BT32, BT33, BT34, BT35, BT36, BT37, BT38, BT39, BT4, BT40, BT41, BT42, BT43, BT44, BT45, BT46, BT47, BT48, BT49, BT5, BT50, BT51, BT52, BT53, BT54, BT55, BT56, BT57, BT58, BT59, BT6, BT60, BT61, BT62, BT63, BT64, BT65, BT66, BT67, BT68, BT69, BT7, BT70, BT71, BT72, BT73, BT74, BT75, BT76, BT77, BT78, BT79, BT8, BT80, BT81, BT82, BT83, BT84, BT85, BT86, BT87, BT88, BT89, BT9, BT90, BT91, BT92, BT93, BT94, BT95, BT96, BT97, BT98 & BT99. AB10, AB11, AB12, AB13, AB14, AB15, AB16, AB17, AB18, AB19, AB20, AB21, AB22, AB23, AB24, AB25, AB26, AB27, AB28, AB29, AB30, AB31, AB32, AB33, AB34, AB35, AB36, AB37, AB38, AB39, AB40, AB41, AB42, AB43, AB44, AB45, AB46, AB47, AB48, AB49, AB50, AB51, AB52, AB53, AB54, AB55, AB56, AB57, AB58, AB59, AB60, AB61, AB62, AB63, AB64, AB65, AB66, AB67, AB68, AB69, AB70, AB71, AB72, AB73, AB74, AB75, AB76, AB77, AB78, AB79, AB80, AB81, AB82, AB83, AB84, AB85, AB86, AB87, AB88, AB89, AB90, AB91, AB92, AB93, AB94, AB95, AB96, AB97, AB98, AB99, DD10, DD11, DD8, DD9, HS1, HS10, HS11, HS12, HS13, HS14, HS15, HS16, HS17, HS18, HS19, HS2, HS20, HS21, HS22, HS23, HS24, HS25, HS26, HS27, HS28, HS29, HS3, HS30, HS31, HS32, HS33, HS34, HS35, HS36, HS37, HS38, HS39, HS4, HS40, HS41, HS42, HS43, HS44, HS45, HS46, HS47, HS48, HS49, HS5, HS50, HS51, HS52, HS53, HS54, HS55, HS56, HS57, HS58, HS59, HS6, HS60, HS61, HS62, HS63, HS64, HS65, HS66, HS67, HS68, HS69, HS7, HS70, HS71, HS72, HS73, HS74, HS75, HS76, HS77, HS78, HS79, HS8, HS80, HS81, HS82, HS83, HS84, HS85, HS86, HS87, HS88, HS89, HS9, HS90, HS91, HS92, HS93, HS94, HS95, HS96, HS97, HS98, HS99, IV1, IV10, IV11, IV12, IV13, IV14, IV15, IV16, IV17, IV18, IV19, IV2, IV20, IV21, IV22, IV23, IV24, IV25, IV26, IV27, IV28, IV29, IV3, IV30, IV31, IV32, IV36, IV37, IV38, IV39, IV4, IV40, IV41, IV42, IV43, IV44, IV45, IV46, IV47, IV48, IV49, IV5, IV50, IV51, IV52, IV53, IV54, IV55, IV56, IV6, IV63, IV7, IV8, IV9, KA27, KA28, KW1, KW10, KW11, KW12, KW13, KW14, KW15, KW16, KW17, KW2, KW3, KW4, KW5, KW6, KW7, KW8, KW9, PA20, PA21, PA22, PA23, PA24, PA25, PA26, PA27, PA28, PA29, PA30, PA31, PA32, PA33, PA34, PA35, PA36, PA37, PA38, PA39, PA40, PA41, PA42, PA43, PA44, PA45, PA46, PA47, PA48, PA49, PA60, PA61, PA62, PA63, PA64, PA65, PA66, PA67, PA68, PA69, PA70, PA71, PA72, PA73, PA74, PA75, PA76, PA77, PA78, PA80, PH19, PH20, PH21, PH22, PH23, PH24, PH25, PH26, PH30, PH31, PH32, PH33, PH34, PH35, PH36, PH37, PH38, PH39, PH40, PH41, PH42, PH43, PH44, PH49, PH50, ZE1, ZE10, ZE11, ZE12, ZE13, ZE14, ZE15, ZE16, ZE17, ZE18, ZE19, ZE2, ZE20, ZE21, ZE22, ZE23, ZE24, ZE25, ZE26, ZE27, ZE28, ZE29, ZE3, ZE30, ZE31, ZE32, ZE33, ZE34, ZE35, ZE36, ZE37, ZE38, ZE39, ZE4, ZE40, ZE41, ZE42, ZE43, ZE44, ZE45, ZE46, ZE47, ZE48, ZE49, ZE5, ZE50, ZE51, ZE52, ZE53, ZE54, ZE55, ZE56, ZE57, ZE58, ZE59, ZE6, ZE60, ZE61, ZE62, ZE63, ZE64, ZE65, ZE66, ZE67, ZE68, ZE69, ZE7, ZE70, ZE71, ZE72, ZE73, ZE74, ZE75, ZE76, ZE77, ZE78, ZE79, ZE8, ZE80, ZE81, ZE82, ZE83, ZE84, ZE85, ZE86, ZE87, ZE88, ZE89, ZE9, ZE90, ZE91, ZE92, ZE93, ZE94, ZE95, ZE96, ZE97, ZE98 & ZE99. IM1, IM10, IM11, IM12, IM13, IM14, IM15, IM16, IM17, IM18, IM19, IM2, IM20, IM21, IM22, IM23, IM24, IM25, IM26, IM27, IM28, IM29, IM3, IM30, IM31, IM32, IM33, IM34, IM35, IM36, IM37, IM38, IM39, IM4, IM40, IM41, IM42, IM43, IM44, IM45, IM46, IM47, IM48, IM49, IM5, IM50, IM51, IM52, IM53, IM54, IM55, IM56, IM57, IM58, IM59, IM6, IM60, IM61, IM62, IM63, IM64, IM65, IM66, IM67, IM68, IM69, IM7, IM70, IM71, IM72, IM73, IM74, IM75, IM76, IM77, IM78, IM79, IM8, IM80, IM81, IM82, IM83, IM84, IM85, IM86, IM87, IM88, IM89, IM9, IM90, IM91, IM92, IM93, IM94, IM95, IM96, IM97, IM98, IM99, TR21, TR22, TR23, TR24 & TR25. Orders that have the 'Economy Delivery' option chosen as the shipping option take between 5 and 10 working days to be delivered from the date of the order being ready to process. If the goods are required sooner than 10 working days from the date of the order we strongly recommend choosing a faster delivery service. Delivery upgrades can be added to your order at any time by contacting us. The Consumer follows the procedures outlined in Term 4.2. The product or products do not comply with our product specifications or technical details. Any faults or damage must have occurred before delivery was deemed to take place as outlined in Term 4.4. and 4.7. If a delivery option is chosen the delivery address must be in the Mainland UK as defined by our postcode list. The order is placed before the specified shipping cut off time. Cleared funds have been received in full before cut shipping off time if customer does not hold a credit account. If a customer holds a credit account, the total order value must not exceed the credit available at time of order. No proofing option or design has been selected for any product within the order. If any business print products are in the order they must be under a quantity of 1,000. No single product in the order has a volumetric size of over 320 cm when packaged. This is 2 x the longest length, + 1 x the next longest length. The order is for a large amount of items that we are unable to produce in time for same day shipping (+1). Order is placed via email, post, fax or any other means other than online (+1). Funds do not clear until after the shipping cut off time or customer has insufficient credit for order (+1). An email proof has been selected for any product within the order (+1). A hard copy proof has been selected for any product within the order (+5). Design has been selected for any product within the order (+3). The order contains business print products with a quantity of 1,000 and above (+1). When packaged, a single product in the order has a volumetric size of over 320 cm (+2). Artwork for any product within the order has been emailed (+1). Artwork for any product within the order has been posted (+3). Security checks or preprocessing checks fail and are not resolved until after the shipping cut off time (+1). Payment is due upfront on all orders from Consumers. We will only consider credit requests from Business customers, standard credit terms require payment within 30 days from the date of the invoice, except in the case of transactions where different terms are agreed in writing. Credit limits will be determined on a customer by customer basis and once this limit has been reached payment must be made on new orders or outstanding debt must be cleared. Payment may be made by BACS, Cash, Cheque, Visa, Debit or Credit Card, Google Checkout and PayPal. Where credit is agreed, all payments must be made within 30 days of order date. After this period any outstanding payments will be subject to interest at the Bank of England base rate plus a debt recovery fee of £15. Any debts that are over 60 days past their due date will be recovered through the small claims court or a debt recovery firm. Where credit is agreed, the initial order on the account must be pro-forma and paid with either a Credit or Debit Card. We reserve the right to store these card details. By opening a credit account you agree to give authorisation for us to use the stored card details to take payment for any overdue funds that exceed the credit limit or agreed credit period. If you have a discount promotional code it is your full responsibility to ensure this is included in the relevant section during the order process. A promotional code or discount offer cannot be applied after you confirm your order. All cancelled orders for custom made products will incur a cancellation charge. This will be charged at 25% up to a maximum value of £9.99 to cover administration costs. In addition to this we will also charge for any production costs or other costs that have already been incurred. Orders where an Email Proof or Hard Copy proof have been sent, and the cancellation request is made immediately after these have been received, will also incur a cancellation fee of 25% up to a maximum value of £9.99. Any orders for custom products that are in a 'Processing' (in production) or 'Completed' (production completed) state cannot be cancelled unless agreed in writing. Custom Canvas Ltd makes every effort to supply the goods as advertised but reserves the right to supply the goods subject to minor variations in actual dimensions and specifications stated. All orders will be produced using the information provided by the customer at the time of order and we will not be held responsible for any errors in order specifications submitted by the customer. A complete list of product specifications can be found online for each product. All products will be manufactured and produced in accordance with these specifications. By purchasing a product you agree to the product specifications and details, including manufacturing tolerances, unless agreed to otherwise in writing. Custom Canvas Ltd uses a highly automated printing procedure and we endeavour to check all artwork files if possible. We cannot be held liable for reprint charges or refunds where artwork of a low resolution or file size has been submitted to print. When ordering any Photo Canvas product, by selecting the 'Gallery Wrap' option you agree that the image will be wrapped around the frame and this may cause a loss of important image details on the front of the frame. If you are unsure please ask for a proof before ordering or alternatively we would recommend using an alternative wrap style. We cannot be held liable for reprint charges of refunds if this occurs. By choosing this option, if parts of the image deemed to be important are wrapped around the frame you hereby give us permission to change the wrap style without notice to a more suitable wrap to prevent this occurring. All content on this website including but not limited to text, images, graphics, code are and copyright of Custom Canvas Ltd and must not be used under any circumstances without our consent in writing. Any images submitted to us for print or any other purposes must not be used if you do not hold copyright to image, or if you do not have written consent from the copyright holder. In submitting the image to print you agree that full authorization for the reproduction and distribution of the image and hold full responsibility to any infringements of copyright of the image. Custom Canvas Ltd reserves the right to use your images for advertising purposes but will not resell them under any circumstances. Custom Canvas Ltd is committed to providing our customers with the highest quality products and service. However, on rare occasions, products may be found to be faulty or defective. In such cases we offer the returns or exchange facilities described below. In accordance with the Sale of Goods act and Distance Selling Regulations, refunds or replacements can be made on stock items to non Business Customers. Custom Canvas Ltd cannot refund any custom products. We are happy to accept returns from Consumers for refund on any stock items within 14 days of receipt. Please note that shipping costs will not be refunded unless the item is found to be faulty. If an item is found to be faulty we can only refund up to a maximum of £7.00 return postage costs. Refunds will be completed on return of the item to us. Refunds to Business Customers are at our discretion. Custom Canvas Ltd cannot accept liability for packages damaged during transit. It is the Customer's responsibility to wrap the product adequately to prevent damage. Artwork design costs quoted online are for up to one hour of design or for one initial design and two design amendments, whichever is first. Additional design costs will be charged at an hourly rate of £20.00 per hour + VAT and charges will be rounded to the nearest minute. The initial design period takes 1 working day though can take longer depending on the complexity of the design. It is the responsibility of the customer to ensure the following information is correct before print. Spelling, Grammar and any other typographical errors. Telephone Numbers, Fax Number and address details. Company Details such as Company Registration Number and VAT Registration Numbers. Layout of objects, images and text. It is your responsibility to check all items listed above and if provided on the attached proof(s). Any further changes beyond this stage, may result in extra charges or even full reprint charges. All print ready files must be created in accordance with our technical guide. It is the client's responsibility to ensure that the technical specifications are met, failure to do so may result in additional charges and a delay to your print deadline. Any printing errors caused by failure to adhere to the technical guide will be at the client's expense. If in any doubt please contact us before ordering. Proofing of files can take up to 1 working day. Any changes to the initial proofs will be charged at an hourly rate of £20.00 per hour + VAT and charges will be rounded to the nearest minute. Orders are only dispatched once the entire order has been completely processed, if you wish to have proofs for only some items we recommend placing these orders as separate orders as the proofing stage may cause a delay to the rest of the job.